Three ingredients. That’s pretty nice. I like natural peanut butter, so that’s what I used here. It’s not as sweet and is much nuttier in flavor. 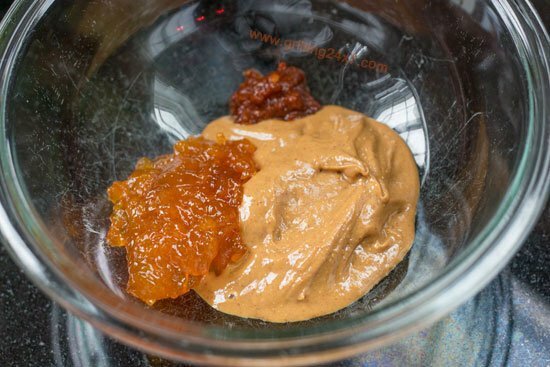 Any type of fruity jelly or jam will work but as I mentioned above, I chose to go with an apricot jam, which I thought would work with the nutty peanut butter a bit better. All of the spice in this recipe is coming from the chipotle peppers in adobo sauce. I have used these in a bunch of recipes, such as this easy three ingredient rib glaze recipe. 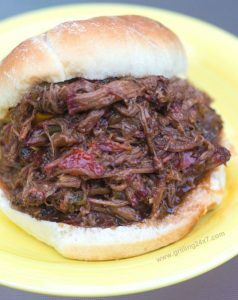 It’s basically a can of smoked jalapenos in an amazing smoky red sauce. These are spicy! 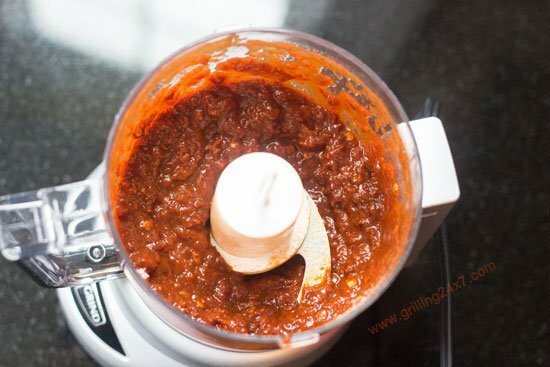 Dump the can of chipotles in adobo sauce into a small food processor and pulse it until smooth. 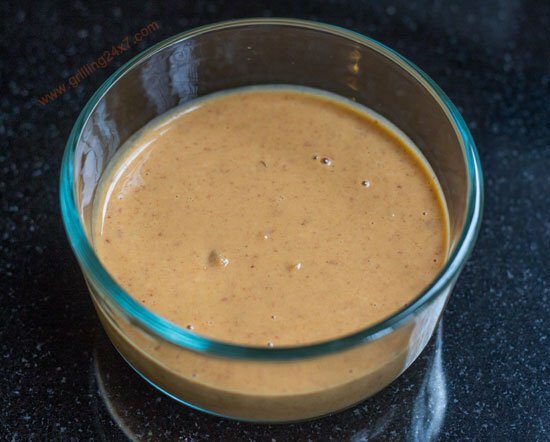 Mix 1/2 cup of peanut butter with about 1/4 cup of apricot jam and 1 tablespoon of chipotle in adobo puree. Add 1/2 cup of water to thin it out a bit (ok 4 ingredients). Mix it up! That was pretty easy. Now get the grill going for a medium heat. 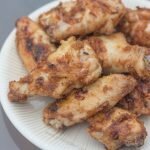 As with other wing recipes on this site (such as this salt and pepper wing recipe) I like the easy method of grilling wings which involves an initial cook of the wings over indirect heat (away from the heat) and then a final crisping/charring of the wings over direct heat. During the final direct heat cooking, the wings are repeatedly brushed with the peanut butter mixture. After about 20 minutes of indirect cooking the wings were around 140 degrees F internal temperature. I tossed some salt and pepper on the wings and then I brushed them with the peanut butter sauce and moved them over the direct heat. The smell was amazing. 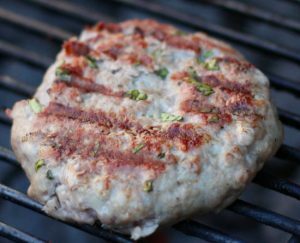 You could smell peanuts at the grill. Rather unique! Brush, turn, brush, turn, brush, turn, etc. I brushed about 5-10 times to get a nice coating of the sauce on the wings. After the wings had an internal temperature of about 165 degrees F they were done. This was a pretty cool recipe. 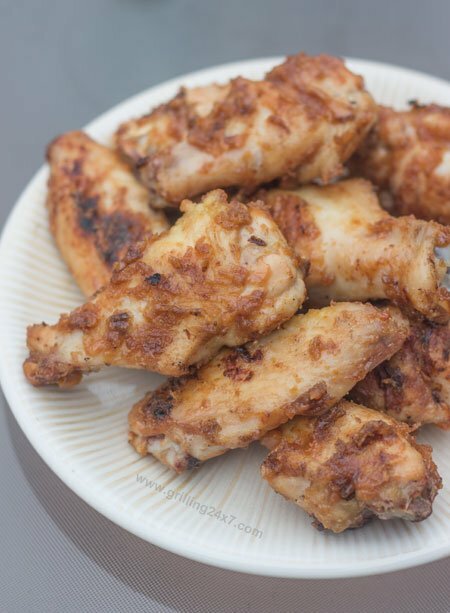 I’m a total hot wing guy and this recipe tasted nothing like the typical hot wing. If you are looking to change things up give this one a try. The recipe is very flexible. If you want a more fruity taste, then increase the amount of apricot jam. If you want it spicier, then double the chipotle puree. 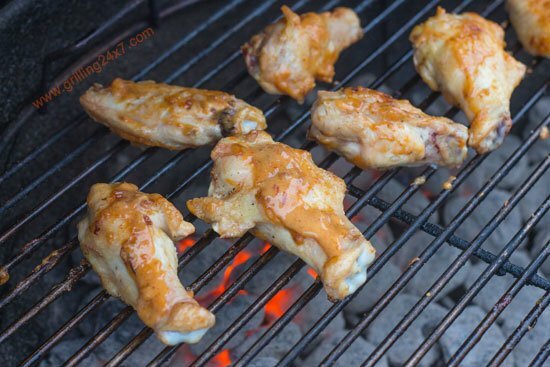 A recipe for grilled chicken wings with a peanut butter and jelly sauce. 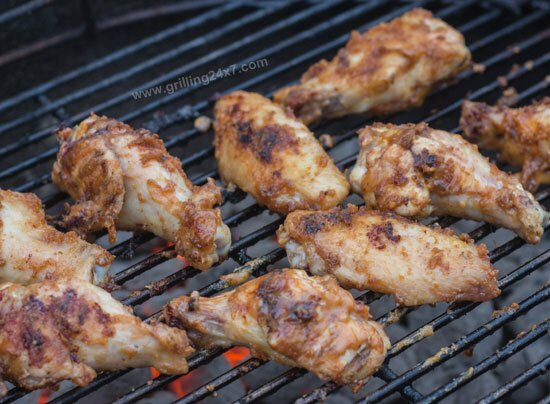 Grill the wings over indirect heat and then move them to direct heat. After moving the wings over the fire sprinkle with salt and pepper and then brush the wings with the peanut butter and jelly sauce. Repeat 5-10 times until the wings are nicely coated with the sauce and are finished cooking (about 165 degrees F). 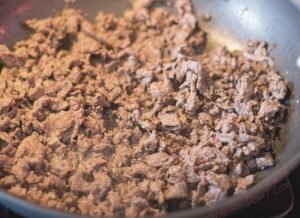 Using a Food Processor to Slice Steak for Cheesesteaks! Is it possible to leave the chipotle out? 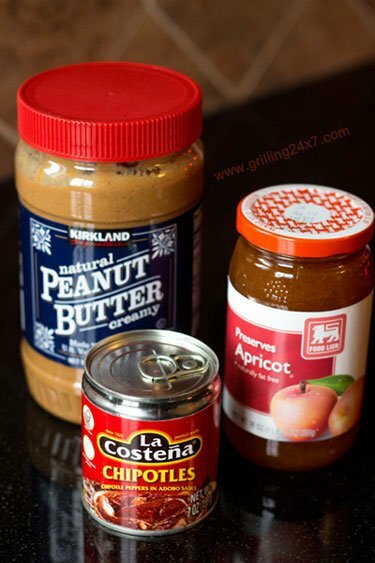 I can’t handle anything spicy but the peanut butter and jelly part sounds delicious.